Christine DeRosa/Staff Photographer Junior guard Carly Boland scored a team-high 19 points in an upset victory for BU over the formerly undefeated conference opponent Hartford. 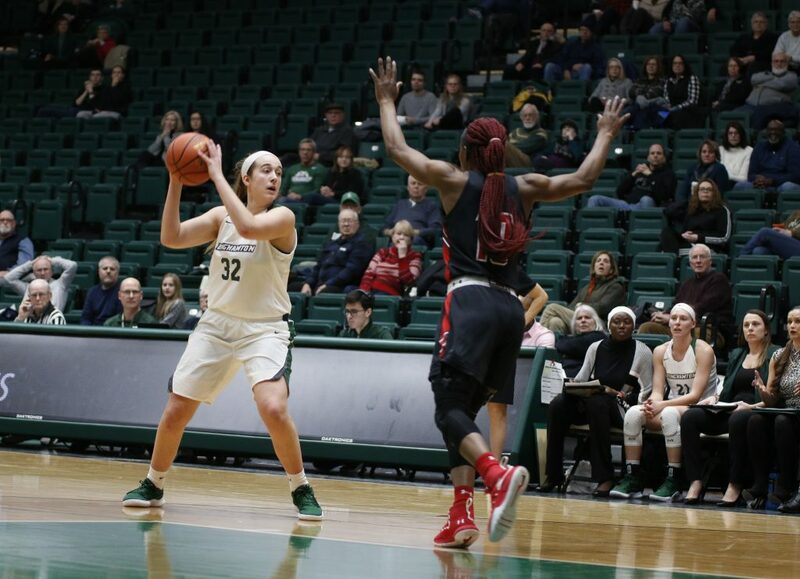 After recovering from a 29-point defeat against the University of Maine, the Binghamton women’s basketball team dismantled the University of Hartford’s perfect America East (AE) record with a 73-62 victory. The game began with a slow start for the Bearcats (9-12, 4-4 AE), as Hartford’s graduate student forward Ella Awobajo put up four points for the Hawks (14-8, 7-1 AE). The two teams went back and forth throughout, and the Bearcats ended the period up one, a 14-13 lead. The second quarter was just as tight, as both teams were within three points of each other until junior guard Carly Boland sank a 3-pointer to put the Bearcats up 28-23. Boland had 19 points in the game, her second highest of the season. Boland also recorded seven rebounds, four dimes and two steals. Although the Bearcats attempted to limit their turnovers, the team ended the game with 24, while the Hawks had just 13. Despite the turnovers, the Bearcats excelled in other areas, with three players hitting double digits. Senior forward Rebecca Carmody came away with 16 points, while junior guard Kai Moon had 15 points. Seven of Moon’s 15 points came from her free throws, making her 78 percent accurate on that front. Carmody also had eight rebounds throughout the match, holding her No. 1 spot in the AE in rebounding. Junior guard Karlee Krchnavi matched Carmody in rebounds and also added three steals. In the third frame, the Hawks cut the lead to just two, as Hartford’s senior guard Lindsey Abed knocked down a 3-pointer and junior guard Sierra DaCosta added a layup. With the Hawks gaining on Binghamton, the Bearcats put their best foot forward, ending the period up 54-44. Freshman guard Hayley Moore saw time in the third period after Moon was knocked over by Awobajo. Although Moore spent just two minutes on the court before Moon came back in, she was able to net a 3-pointer. The Ramil sisters, freshman guard Annie Ramil and sophomore forward Olivia Ramil, also had perfect shot accuracy, with both sisters coming away with eight points. Olivia Ramil also contributed four blocks. The Bearcats pushed themselves throughout the fourth period, advancing their lead to as much as 19 points. The Bearcats commanded the fourth period, defeating the Hawks 73-62 and making the top team in the conference rethink its game. “Don’t count us out yet,” Carmody said. The Bearcats are set to take on the University at Albany at home on Saturday. Tipoff is scheduled for 2 p.m. from the Events Center in Vestal, New York.